Rikako Ikee is an 18 year old Japanese swimmer who specializes in freestyle and butterfly events. She first emerged onto the global stage in 2015 and has been a constant international presence since, claiming records and medals locally and internationally. At the 2018 Asian Games, she became the first female athlete in any sport to win 6 gold medals at a single Games - and all her wins set new Asian Games records. Her performance earned her the title of first ever female MVP at the Asian Games. In terms of records, Rikako holds the long and short course national records in 50m, 100m, and 200m freestyle, and 50m and 100m fly. She is also a jr. world record holder in the 50m freestyle, 50m butterfly, and 200m IM. 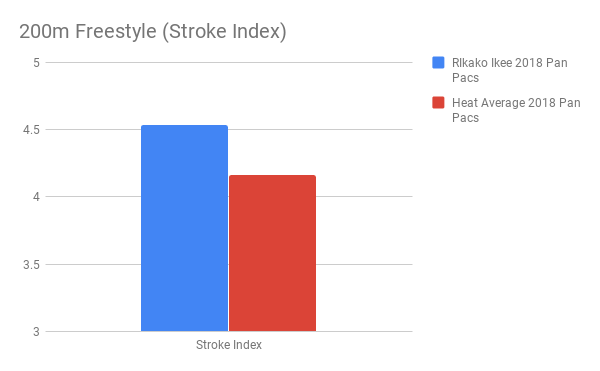 We looked at Rikako Ikee’s 100m butterfly metrics from the 2016 Olympic Games and 2017 FINA World Championships, as well as her 200m freestyle metrics from the 2018 Pan Pacific Championships. We analyzed her performance over time, and looked at how her metrics compared to her competitors and how her strategy changed between different events. At the 2017 World Championships, Rikako maintained the most consistent speed from the 1st to the 2nd lap of the 100m butterfly, her speed declining the least on the back half of the race. At the 2016 Olympics, only 1 other competitor had a more stable pace. Though her overall speed fell just slightly below heat average, placing her 6th in both competitions, she clocked in the most even splits (2nd most in 2016). This enabled her to catch up to some of her competitors to finish at a higher ranking than she had been in on the 1st lap. In the 200m freestyle at the 2018 Pan Pacs, her speed was faster on average than the rest of the field. Similar to her 100 fly, her speed didn’t fall as much from one lap to the next. She slowly bridged the gap until finally beating Katie Ledecky to the wall when she increased her speed on the last 50. 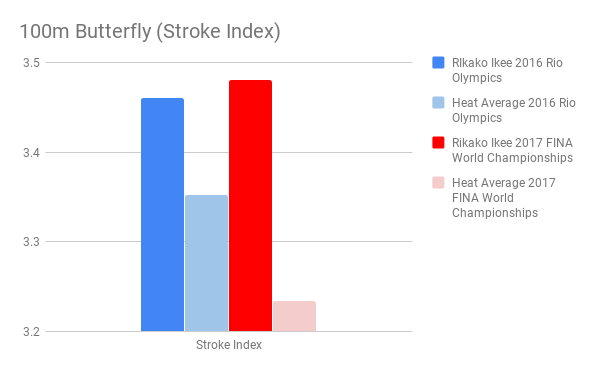 In both her fly and free events, Rikako swam with higher DPS at a slower stroke rate. On average, every stroke she took brought her farther out than her competitors’ strokes. This meant that in all 3 races, she took at least 1 to 2 strokes less than everyone else in her heat. Though she had one of the slowest stroke rates across all 3 events, she was able to speed up her strokes the most in the second half of the races - most of her competitors’ strokes slowed, especially after the halfway mark of the 100 fly. 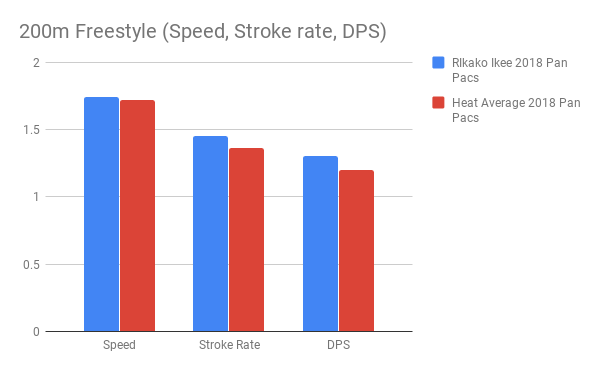 Despite her slower than average stroke rate, Rikako was able to use her long and powerful strokes to generate a good amount of speed. This translated into a high stroke index, indicating that she had great butterfly and freestyle efficiency. The efficiency of her strokes largely contributed to the smaller decline in speed in the 2nd 50 of her 100 fly and increased speed in the final 50 of the 200 free. With highly efficient strokes, she had enough left in her to better power through the second half of her races. 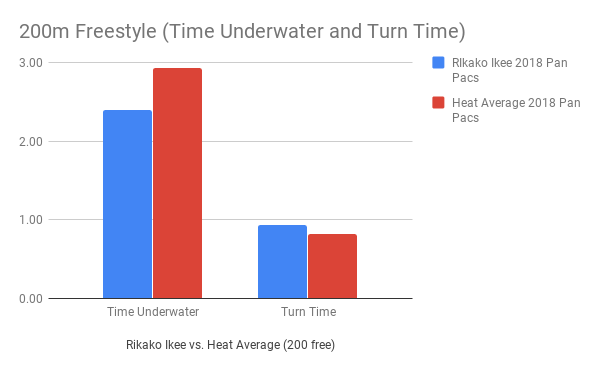 Rikako Ikee's underwater strategy varied between her fly and free events. Her time underwater in the 100m fly was longer than heat average at both the 2016 Olympics and 2017 World Championships, but shorter than heat average in the 200m free at the 2018 Pan Pacs. On average, she spent around 0.1 seconds longer underwater in the 100m fly, but broke out around half a second earlier than the rest of the field in the 200m free. 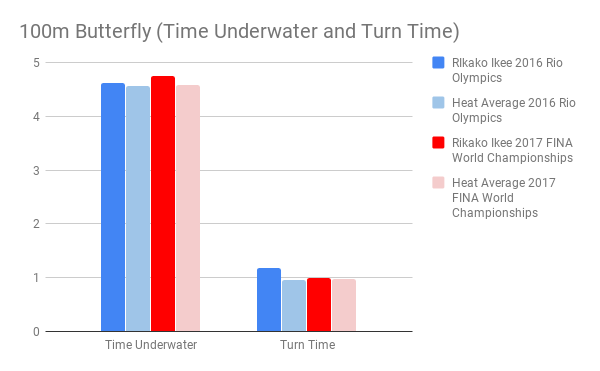 Rikako had a slower turn time than the heat average in all 3 competitions, but her turns in the 100m fly did improve from 2016 to 2017. Efficient strokes is essential to sustaining speed throughout the entire distance of an event. Though she didn’t gain an early lead in any of these events, Rikako finished her races strong. Her speed on her final lap across all 3 races moved her from 8th to 6th at the 2016 Olympics, 7th to 6th at the 2017 World Championships, and 3rd to 2nd at the 2018 Pan Pacific Championships. Know your strengths and use them to your advantage. An athlete’s ideal race strategy can vary between different events. 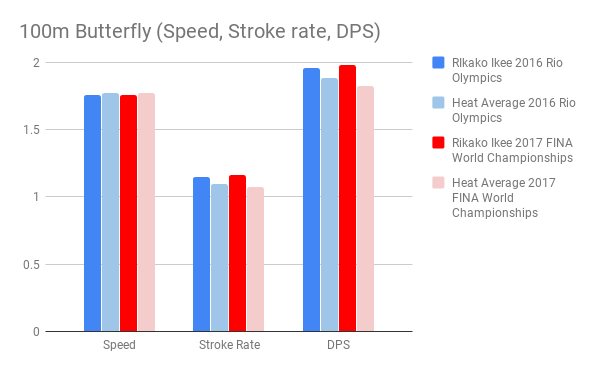 But in Rikako’s case, a high DPS at a slower stroke rate works well for her, and so she uses this strategy to swim both butterfly and freestyle races successfully.